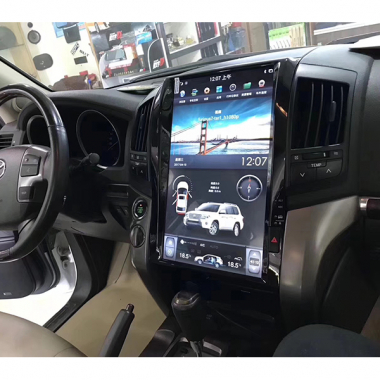 Toyota Land Cruiser radio replacement with Android head unit can be upgraded with Tesla style large 16" vertical screen now. No matter if your car has factory navigation system or not, this LC200 Android radio can fit your Toyota Land Cruiser LC 200 2008-2015 year model. The new 16" Android screen is clear with 2K resolution, support touch screen. Your air conditioning system information can display on the new screen, and you can control it easily, split screen is also available. It does not support factory camera displaying but you can install a new aftermarket rear view camea instead, which is cheap but with HD image. The Toyota Land Cruiser Android head unit radio replacement can fit both left hand driving and right hand driving models. If you want to confirm if this head unit fits your car, you can send us your car info including model, year and a dashboard photo. For premium model with original navigation system your should add the premium model to install for your car.